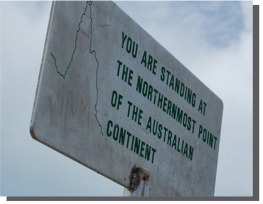 The Cape York Peninsula is Australia's last true Wilderness Frontier. covering over 115,000 sq/km, Cape York is vast - it's larger than the state of Victoria, it's even bigger than England, Scotland and Wales combined! due to the monsoonal wet season, Cape York is only accessible between May and October, due to this booking your Cape York Tour adventure well in advance is highly advised. This 10 day Drive / Fly tour includes tours of Horn and Thursday Islands and can be done in either direction. This 12 day Overland/Sea tour includes a all the Highlights and a cruise back to Cairns. This 16 day all Overland tour includes tours of Horn and Thursday Islands and is our longest Cape York option. This 8 day Fly/Drive tour includes tours of Horn and Thursday Islands and can be done in either direction. This very small group 3 day tour takes you on an exclusive guided 4WD tour to the Daintree National Park, Cooktown, and the Atherton Tablelands.